In their Sunday game against the Los Angeles Angels, two members of the Texas Rangers celebrated a home run by briefly grabbing each other’s crotches. We’ve seen athletes slap each other’s butts and even kiss before, but this celebration seems … new. After Texas Rangers left fielder Joey Gallo scored a home run, he met with right fielder Nomar Mazara. The two exchanged a special handshake before grabbing each other and tugging twice. Sadly, the attention given to their “cup check” has led both men to apologize and pledge never to do it again. Surprisingly,“non-sexual physical intimacy” and physical affection between male friends is more common than we think. A 2017 study found that men in bromances sometimes hug, kiss and share their most intimate secrets with other dudes. In fact, as societal machismo lessens, men increasingly depend on each other for closeness because it helps them express a healthy vulnerability with other dudes (something that was more common in society before widespread homophobia took hold). 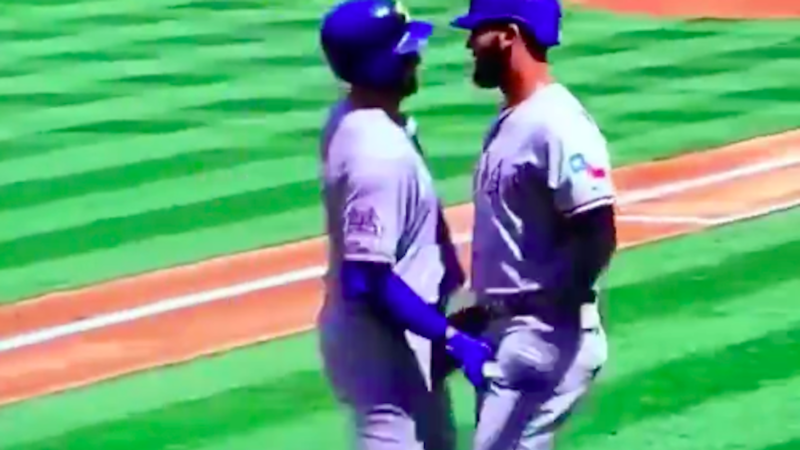 Gallo and Mazara’s moment is hardly the first instance of physical affection between two male pro baseballers. In August 2018, Atlanta Braves players Ronald Acuña Jr. and Ozzie Albies cuddled in the dugout during their game against the Los Angeles Dodgers. In another bulge-y celebration, Houston Astros player Josh Reddick celebrated his team’s October 2017 victory against the Seattle Mariners by stripping down to his American flag speedo and dancing while his teammates sprayed him with champagne. Totally normal. Men have balls. Those who have *more* balls do this kind of celebration. Oh my………..fertility ritual? Seems normal to me too, unless the men involved are mentally children, which pretty much sums up homophobes. Only gay male snowflakes and their enablers in the form of vexatious feminists would be offended by this display of manliness. Truth! ….Also, I’ve never heard the word “vexatious”, but I love it!